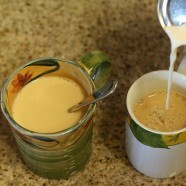 Next time you are thinking about a latte, why not make a delicous, warming pot of chai tea instead? Chais are as unique as a chef’s fingerprint, so there are thousands of recipes out there. My personal favorite evolves all the time, depending on my mood; spicy one day, a hint of orange peel the next. You really can’t go wrong. True aficionados will tell you to use authentic Indian spices and grind them by hand just before you use them, but we aren’t trying to win the James Beard Award. We’re just trying to make a good cup of Chai easily, so we can enjoy it anytime. Put everything in a saucepan except the tea and bring it to a full boil. Turn off the heat and stir in the tea. Let it steep for a minute or two (you don't want the tannins from the tea to make it bitter), the pour through a strainer into a teapot or cup. Makes 4 or 5 servings, depending on your cup size, but you and your friend can easily drink the whole pot.